The TARDIS is dragged down a time corridor, forcing the Fifth Doctor (Peter Davison), Tegan (Janet Fielding) and Turlough (Mark Strickson) to materialize in a disused part of London in 1984. The corridor links Earth with a battle cruiser in the future that contains the Doctor's oldest enemy - the Daleks. Having lost the war with the Movellans, only one person can now help the evil race. With shocking consequences for the Doctor, it is time for the Daleks to resurrect their creator Davros (Terry Malloy). The TARDIS is dragged down a time corridor, forcing the Fifth Doctor (Peter Davison), Tegan (Janet Fielding) and Turlough (Mark Strickson) to materialize in a disused part of London in 1984. The corridor links Earth with a battle cruiser in the future that contains the Doctor's oldest enemy - the Daleks. Having lost the war with the Movellans, only one person can now help the evil race. With shocking consequences for the Doctor, it is time for the Daleks to resurrect their creator Davros (Terry Malloy). 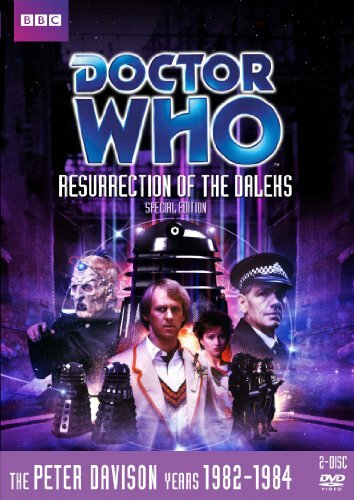 This digitally re-mastered edition of the Doctor Who classic includes audio commentary with actor Terry Malloy, writer Eric Saward and visual effects designer Peter Wragg; additional audio commentary with actors Peter Davison, Janet Fielding and director Matthew Robinson; alternate 4-part version of the story; Come In Number Five retrospective of the Fifth Doctor presented by David Tennant; as well as many other bonus features. Doctor Who is a British science fiction television programme produced by the BBC. The programme depicts the adventures of a Time Lord�a time travelling, humanoid alien known as the Doctor. He explores the universe in his TARDIS�a sentient, telepathic time machine that flies through time and space. Its exterior appears as a blue British police box, which were common in 1963, when the series first aired. Along with a succession of companions, the Doctor faces a variety of foes while working to save civilisations, help ordinary people, and right wrongs.